Transparency Market Research states that the top three players in the global alternators market held a share of 20% in the overall market in 2015. Emerson Electric, Co., Denso Corporation, and Valeo SA have had a noticeable share in the market due to their strong foothold in the automotive industry, which is the largest consumer of alternators. “Companies must focus on the construction in emerging economies of the Middle East and Africa during the forecast period to gain a competitive edge over others,” states the lead author of this research report. Focus on research and development is also expected to remain the mainstay of the majority of the players in the market to deliver product innovation to consumers. 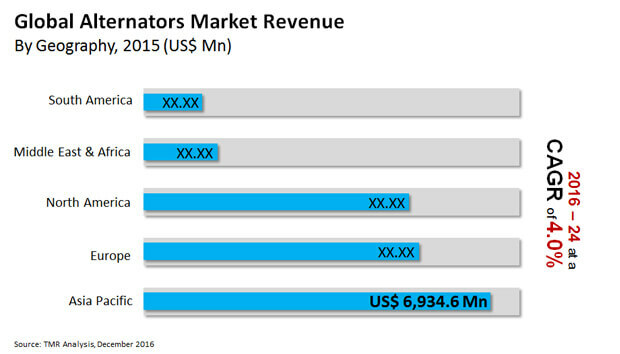 According to the research report, the global alternators market is expected to be worth US$28.9 bn by the end of 2024 as compared to US$20.3 bn in 2015. During the forecast years of 2016 and 2024, the global alternators market is expected to progress at a CAGR of 4.0%. On the basis of voltage range, the global market is segmented into low voltage, medium voltage, and high voltage. Of these, the low voltage alternator segment is expected to remain the leading segment due to its soaring demand in the automotive sector. Analysts anticipate that the low voltage segment is expected to progress at a CAGR of 3.7% during the forecast period. The growing demand for back-up power in several emerging economies is also expected to fuel the demand for low voltage alternators during the forecast years. Geographically, this market is segmented into Europe, North America, Asia Pacific, South America, and the Middle East and Africa. Of these, North America held a dominant share in the global market and is projected to surge at a CAGR of 3.6% during the forecast period, in terms of revenue. The report indicates that Asia Pacific will also be an emerging opportunity for the overall market in the coming years due to the strengthening economies in the region. The global alternators market is expected to receive a massive impetus from the booming automotive sector in the emerging economies of China, South Africa, India, Mexico, Indonesia, and Taiwan. The increasing production of vehicles in these countries is likely to offer several lucrative opportunities to the alternators market during the forecast period. The increasing automotive sales are also expected to complement the uptake of alternators in the near future. The insatiable demand for power across the globe is yet another reason for the growing adoption of alternators in various industrial sectors. The demand for power is expected to rise as the investments are slated to grow in construction and infrastructural sectors. Furthermore, rising expenditure in the utility sector is also expected to have a positive impact on the global alternators market. The volatility of economy has an impact on several aspects of a nation’s overall growth. Thus, the economic slowdown in several developed nations has had a severe impact on the demand for alternators. The cuts in capital outflows, state policy changes, and political challenges has retarded the pace of infrastructural development in several countries across the globe, which has declined the sales of alternators. The global market is also being stymied by the slump in the chemical and mining industry amid growing worries about global warming and political tensions.